Audiences at the Boulder Film Festival this year got something extra after the curtains closed. On Saturday, two days after the Ringling Bros. and Barnum and Bailey Circus announced it was retiring its elephants, the tallest building in Boulder was lit up with a message of congratulations. But that wasn't all - a challenge to SeaWorld, long called the "sea circus" by animal advocates, came along with it. Many animal advocates noted that Ringling's decision marked a shift in public demand for animals: audiences want to see happy, healthy animals - not captive animals in chains or tanks. 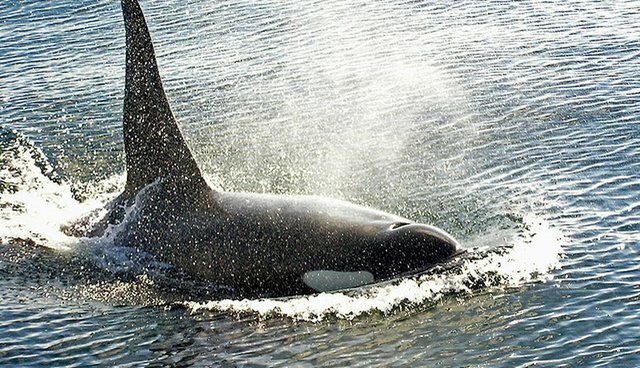 Many urged SeaWorld to follow in Ringling's wake and retire its orca whales and other cetaceans. The message was projected by the Oceanic Preservation Society (OPS), a group that entered their film "Racing Extinction" in the festival this year. "The Ringling Bros.' decision to end the use of elephants in its circus shows is just the beginning of the end of using wild animals for human entertainment," Candace Crespi of OPS told The Dodo. "Will dolphins and whales be next? We must keep the pressure on SeaWorld."